Genus summary: Sphecodes (sfe-KO-deze) is a large cleptoparasitic genus found on all continents and is widespread throughout its range. There are about 80 species in North America and it has been estimated there are about 60 species in California, many do not have names. These bees are not very well known and are not well represented in museum collections so; these are only estimates of the numbers of species. Sphecodes are cleptoparasites – that is they invade the nest and lay their eggs in the cells of the other species. Their offspring then kill the host larvae and take over the provisions of the host bees. Members of the genus Sphecodes primarily lay their eggs in the nests of Halictus and Lasioglossum species. These cleptoparasites are commonly referred to as “cuckoo bees” because their behavior mimics that of cuckoo birds. 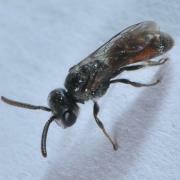 Description: These are usually shiny brown to black slender bees with few hairs. They often have red on all or part of the abdomen. They are minute to moderate in size ranging from 0.2 to 0.6 inches (4.5 to 15 mm) long. Under a microscope, you can see that the basal vein of the fore wing is strongly arched at the base of the vein and all the veins are equally strong. They have no hairbands on the terga unlike Halictus and males do not have yellow on the clypeus. Like all other cleptoparasites, Sphecodes lack pollen-collecting hairs because they only visit flowers to drink nectar, not to collect pollen. Under a microscope, you can see the relatively large depressions (punctuation) in the exoskeleton that makes them look like a coarse sculpture. Females have spines on their hind legs that they use to brace themselves in the tunnel of a nest when being attacked by a host bee. They also have lots of ridges and lamellae in their exoskeleton that help deflect the sting and mandibles of an angry host. Similar insects: Sphecodes can resemble wasps. Males of Sphecodes look similar to Lasioglossum males, but have shorter antennae and face and an entirely black clypeus. They also look similar to Lasioglossum males but do not have the same metallic sheen or the yellow markings on their face and legs.